Background: Rheumatoid arthritis is a chronic relapsing autoimmune disorder with multifactorial etiology and prognosis. Morin [2-(2,4-dihydroxyphenyl)-3,5,7-trihydroxy-4H-1-benzopyran-4-one], a plant flavonoid reported having antioxidant and anti-inflammatory potential. Objective: The aim is to study the anti-arthritic activity of the morin against adjuvant-induced polyarthritis in rats. Materials and Methods: Polyarthritis was induced in female Wistar rats (150–180 g) using Freund's complete adjuvant (FCA) in the tail. Leflunomide (10 mg/kg, as a standard) and morin (10, 30 and 100 mg/kg) were administered orally daily for 28 days. Results: Treatment with morin (30 and 100 mg/kg) showed statistically significant inhibition (P < 0.05) in FCA-induced decrease in thermal hyperalgesia and mechanical hyperalgesia. It also showed significant attenuation (P < 0.05) in FCA-induced alterations in hematological parameters, aspartate aminotransferase, alanine transaminase, alkaline phosphatase, serum turbidity, albumin, C-reactive protein, blood sugar levels, and erythrocyte sedimentation rate. Altered levels of serum and liver lipid profile were significantly attenuated (P < 0.05) by morin (30 and 100 mg/kg). Morin treatment significantly decreased (P < 0.05) serum oxido-nitrosative stress, tumor necrosis factor-alpha (TNF-α), and interleukin-1β (IL-1β) levels. Morin (30 and 100 mg/kg) also significantly (P < 0.05) inhibited FCA-induced up-regulated liver TNF-α, IL-1β, IL-6, heme oxygenase-1, transforming growth factor-beta and down-regulated nuclear factor erythroid 2-related factor-2 messenger RNA expression. Histopathology alteration-induced by FCA was also reduced by morin treatment. Conclusion: Morin showed promising curative properties against FCA-induced polyarthritis in rats via modulation of endogenous biomarkers. Thus, morin can be considered as an alternative treatment regimen for the management of arthritis. Abbreviations used: AIA: Adjuvant-induced arthritis, ALT: Alanine transaminase, ALP: Alkaline phosphatase, AST: Aspartate aminotransferase, BSL: Blood glucose level, CRP: C-reactive protein, ESR: Erythrocyte sedimentation rate, FCA: Freund's complete adjuvant, HO: Heme oxygenase, HDL: High-density lipoprotein, IL-1β: Interleukin-1 beta, LDL: Low-density lipoprotein, MDA: Malondialdehyde, NO: Nitric oxide, Nrf2: Nuclear factor-like 2, ROS: Reactive oxygen species, GSH: Reduced glutathione, RT-PCR: Reverse transcription-polymerase chain reaction, SOD: Superoxide dismutase, TC: Total cholesterol, TGF-β: Transforming growth factor-beta, TG: Triglyceride, TNF-α: Tumor necrosis factor-alpha, VLDL: Very low-density lipoprotein. Morin can be considered as a potential antiarthritic agent for further development. Rheumatoid arthritis (RA) is a chronic inflammatory disease of multi-factorial etiology characterized by synovial hyperplasia, vasculogenesis, cartilage and bone destruction, and joint malformation. It is the most common form of arthritis that leads to pain, inflammation, and tissue damage causing restriction of movements of the limb. The symptoms of RA include pain, swelling, morning stiffness, warmth, redness, and limited functions of the joints. The prevalence of the RA estimated in populations from different developed countries was 0.5%–1%. The systemic ramifications of the disease, apart from morbidity and mortality, include cardiopathy, nephropathy, vasculopathy as well as pulmonary and cutaneous disorders. Although the cause of RA is unknown, autoimmunity plays a pivotal role in its chronicity and progression. Thus, it is considered as a systemic autoimmune disease. Although non steroidal anti-inflammatory drugs (NSAIDs), disease-modifying antirheumatic drugs (DMARDs), and corticosteroids appear to be highly efficient drug therapies in the treatment of RA, they may cause side effects that can range in severity from mild to serious. The major adverse drug reactions-associated with NSAIDs are gastrointestinal (perforation, ulceration, or bleeding), and cardiovascular (myocardial infarction) with effects on other systems. Despite their wide clinical uses, the long-term implication of NSAIDs is a major clinical problem due to their side-effects. Some of the NSAIDs were withdrawn from the market because of the risk of heart attacks and stroke. On the other hand, other therapies against arthritis such as DMARDs and biological agents had a risk of immunosuppression and serious infection on long-term usage. Furthermore, ascending morbidity of RA, together with occasional intolerable adverse effects of DMARDs, puts burden over medical researchers to find alternative treatment strategies. Therefore, the search for safer drugs for the management of RA in the long-term uses is still going on. Among the various experimental animal models of arthritis, Freund's complete adjuvant (FCA)-induced arthritis (AIA) in rats is the most reliable animal model. AIA model mimics the human pathophysiological state characterized by chronic swelling in multiple joints due to the accumulation of inflammatory cells, joint cartilage erosion, and bone destruction. Thus, AIA has been used extensively to investigate the potent anti-arthritic agents. Recently, botanical medicines have become popular as alternative remedies due to their effectiveness, and safe. Morin [2-(2,4-dihydroxyphenyl)-3, 5, 7-trihydroxy-4H-1- benzopyran-4-one] is one such plant flavonoid bearing potent antioxidant and anti-inflammatory property. Morin widely exhibits in the various plant including Maclura pomifera (Osage orange), Maclura tinctoria (old fustic), and Psidium guajava (common guava). The health and therapeutic benefits of morin have been extensively reviewed in the traditional and modern literature. An array of studies carried out over the past decade revealed anti-cancer, antiulcer, anti-allergic, anti-asthmatic, cardioprotective, renoprotective, and antihypertensive potential of morin.,, Furthermore, studies have reported attenuative potential of morin against oxidative stress via modulation of superoxide dismutase (SOD), catalase, and glutathione peroxidase activities. To the best of our knowledge, no study has been yet reported antiarthritic potential of morin. Hence, the present investigation aimed to evaluate the potential of morin against AIA-induced arthritis by assessing various behavioral, biochemical, and molecular parameters in rats. Female Wistar rats (150–180 g) were obtained from the National Toxicology Centre, Pune, India. The rats were housed in polypropylene cages at a temperature of 24°C ± 1°C with 12 h: 12 h dark–light cycle, with free access to standard pellet feed (Chakan Oil Mill, India) and filtered water. All experiments were carried out between 08:00 h and 17:00 h in a quiet laboratory. The research protocol was approved by the Institutional Animal Ethics Committee and as per Indian norms laid down by the Committee for the Purpose of Control and Supervision of Experimental Animals, New Delhi. On day-0 of study, AIA was induced in rats (150–200 g) (five groups, i.e., Group II to VI, n = 12) by single intradermal injection of 0.1 ml FCA (Sigma Aldrich, St. Louis, USA) into the tail of the rats. FCA contains 0.6 mg heat-inactivated Mycobacterium tuberculosis H37Ra emulsified in a sterile mixture of paraffin oil, saline, and Tween 80. The 32 days was allowed to develop arthritis. A separate group of rats (Group I, n = 12) was maintained as normal and did not receive FCA. After the development of AIA (after 32 days), animals were received either distilled water (10 ml/kg, p. o., i.e., Group I and II) or leflunomide (10 mg/kg, as a standard, i.e., Group III) or morin (10, 30, and 100 mg/kg, i.e., Group IV to VI) for the next 28 days. Paw volume was determined by using a plethysmometer (Ugo Basile, Italy). Percentage (%) inhibition of paw volumes was calculated according to the equation reported previously. Pain latency against mechanical hyperalgesia (paw withdrawal latency) was determined by using Randall–Selitto (Ugo Basile Model 7200). On the last day of study (on day 60), rats were sacrificed by cervical dislocation and blood was withdrawn for erythrocyte sedimentation rate (ESR), C-reactive protein (CRP) and hematological measurements (red blood cell [RBC], hemoglobin [Hb], hematocrit, mean corpuscular volume, mean corpuscular Hb concentration [MCH], mean corpuscular Hb concentration [MCHC], total leukocyte count, lymphocytes, and platelets). The serum was separated by centrifugation using an Eppendorf microcentrifuge and used for serum turbidity measurement. The levels of serum albumin, alkaline phosphatase (ALP), aspartate transaminase (AST), alanine transaminase (ALT), blood glucose level (BSL), total cholesterol (TC), high-density lipoprotein (HDL), low-density lipoprotein (LDL), very LDL (VLDL), and triglyceride (TG) were measured by a spectrophotometer (ultraviolet-visible spectrophotometer, Jasco V-530, Tokyo, Japan) using commercially available reagent kits according to the procedure provided by the manufacturer (Accurex Biomedical Pvt. Ltd., Mumbai, India). The levels of tumor necrosis factor-alpha (TNF-α) and interleukin-1β (IL-1β) levels in the serum were determined by enzyme-linked immunosorbent assay using commercial kits (Thermo Fisher Scientific, USA) as per the manufacturers' instructions. All animals were sacrificed at the end of the study; the liver was immediately isolated. Tissue homogenates (n = 5) were prepared with 0.1 M Tris-HCl buffer (pH 7.4), and supernatant of homogenates was employed to estimate SOD, Reduced Glutathione (GSH), lipid peroxidation (malondialdehyde [MDA]), and nitric oxide (NO) as described previously. Another portion of liver tissue was homogenized in methanol and filtered through a Whatmann number 1 filter paper. The residue after filtration was scraped and homogenized in chloroform. The residue was once again scraped from the filter paper and ground with 10 ml of a chloroform-methanol mixture (2:1, v/v) and the resulting filtrate was evaporated to dryness. Further, lipids in tissue residue were determined by the previously reported method. The levels of messenger RNA (mRNA) were analyzed in liver tissue (n = 5) using reverse transcription-polymerase chain reaction (PCR) as described previously. Single-stranded cDNA was synthesized from 5 μg of total cellular RNA using reverse transcriptase kit (MP Biomedicals India Private Limited, India) as described previously. The primer sequence for TNF-α, IL-1β, IL-6, Nuclear factor erythroid 2-related factor-2 (Nrf-2), heme oxygenase-1 (HO-1), transforming growth factor-beta (TGF-β), and β-actin are presented in the [Table 1]. Amplification of β-actin served as a control for sample loading and integrity. The intensity of mRNAs was standardized against that of the β-actin mRNA from each sample, and the results were expressed as the PCR-product/β-actin mRNA ratio. Ankle joints from the two rats of each group were separated, cleaned, and washed in cold physiological saline, and preserved in 10% of formaldehyde solution until histopathological studies. At the time of staining, sections of tibiotarsal joints were cut (5-μm thickness) with the help of microtome, deparaffinated and stained using hematoxylin and eosin (H and E) stain. The sections were observed, and photomicrographs were taken for histology assessment. Data were expressed as means ± standard error of the mean. All statistical tests were performed using Prism 5.0 (Graph Pad, San Diego CA, USA) statistical software. The data were considered statistically significant at P < 0.05. Administration of FCA brought a significant (P < 0.05) decreased in body weight and liver weight, as well as an, increase in spleen weight in AIA control group as compared to the normal group. Oral administration of LF (10 mg/kg) showed the significant (P < 0.05) increased in body weight, liver weight, and a decreased in spleen weight than that of AIA control group. When compared with AIA control group, morin (30 and 100 mg/kg) treated rats also significantly (P < 0.05) inhibited FCA-induced alteration in body, spleen, and liver weights. Morin (10 mg/kg) treated rats also showed significantly (P < 0.05) increased body weight than that of the AIA control group. Administration of LF (10 mg/kg) showed that more significant (P < 0.05) attenuation in FCA-induced altered body, spleen, and liver weights than that of the morin-treated rats [Table 2]. Mean paw volumes and joint diameter were increased significantly (P < 0.05), whereas thermal and mechanical hyperalgesia were decreased significantly (P < 0.05) in AIA control rats as compared to that of the normal group. Treatment of LF (10 mg/kg) and morin (30 and 100 mg/kg) significantly (P < 0.05) inhibited FCA-induced alterations in mean paw volumes, joint diameter, thermal, and mechanical hyperalgesia as compared to that of the AIA control rats. The percentage inhibition of paw volume in LF (10 mg/kg) treated rats was 54.87%, whereas in morin (10, 30, and 100 mg/kg) treated groups, it was 3.87%, 23.28%, and 49.59%, respectively [Figure 1] and [Figure 2]. AIA control rats showed significantly (P < 0.05) increased AST, ALT, ALP, and CRP levels and significant (P < 0.05) decreased in albumin and serum turbidity as compared to that of the normal rats. Treatment with LF (10 mg/kg) showed a significant decreased in AST, ALT, ALP, and CRP and significant (P < 0.05) increased in albumin and serum turbidity as compared to that of the AIA control group. Administration of morin (30 and 100 mg/kg) also showed significant (P < 0.05) inhibition in FCA-induced alterations in levels of AST, ALT, ALP, CRP, albumin and serum turbidity as compared with AIA control group. Administration of morin (100 mg/kg) showed more significant (P < 0.05) decreased in AST and ALT levels as well as increased in albumin and serum turbidity as compared to that of the LF (10 mg/kg) treated rats [Table 2]. AIA control rats showed a significant decreased (P < 0.05) in RBC and Hb as well as a significant increased (P < 0.05) in white blood cell (WBC) as compared to that of the normal rats. Treatment of LF (10 mg/kg) showed the significant inhibition (P < 0.05) in FCA-induced alterations in hematological parameters, i.e., RBC, WBC, and Hb as compared to that of AIA control rats. Morin (30 and 100 mg/kg) treatment also showed significantly increased (P < 0.05) in RBC and Hb as well as significantly decreased (P < 0.05) in WBC as compared to that of the AIA control rats. Administration of LF (10 mg/kg) showed a more significant increased (P < 0.05) in RBC and Hb as well as a significant decreased (P < 0.05) in WBC as compared to morin-treated rats [Table 3]. The ESR and BSL levels were increased significantly (P < 0.05) in AIA control rats as compared to that of the normal rats. Treatment with LF (10 mg/kg) showed significant (P < 0.05) decreased in ESR and BSL levels as compared to that of the AIA control rats. Morin (30 and 100 mg/kg) treatment showed statistically significant (P < 0.05) decreased in ESR and BSL levels as compared with AIA control rats. The decreased in ESR and BSL levels was more statistically significant (P < 0.05) in LF (10 mg/kg) treated rats as compared to that of the morin-treated rats [Table 3]. There was a statistically significant (P < 0.05) increased in TG, TC, LDL-cholesterol (LDL-C), and VLDL-C, whereas significant (P < 0.05) decreased in HDL-cholesterol (HDL-C) level in serum and liver of AIA control rats as compared to that of the normal rats. Treatment with LF (10 mg/kg) showed significant (P < 0.05) attenuation in FCA-induced alterations in serum and liver lipid profile as compared to that of the AIA control rats. Administration of morin (30 and 100 mg/kg) showed significant decreased (P < 0.05) in TG, TC, LDL-C, and VLDL-C, whereas significant increased (P < 0.05) in HDL-cholesterol levels as compared to that of the AIA control rats. The attenuation of FCA-induced alteration in serum and liver lipid profile was more statistically significant (P < 0.05) in LF (10 mg/kg) treated rats when compared with morin-treated rats [Table 4]. Administration of FCA resulted in significantly decreased (P < 0.05) SOD and GSH levels, whereas significant increased (P < 0.05) in MDA and NO levels in AIA control rats as compared to that of the normal rats. Administration of LF (10 mg/kg) showed statistically significant increased (P < 0.05) in SOD and GSH levels, whereas significant decreased (P < 0.05) in MDA and NO levels as compared to that of the AIA control rats. Treatment with morin (30 and 100 mg/kg) showed the significant attenuation (P < 0.05) in FCA-induced increased in oxido-nitrosative stress as compared to that of the AIA control rats. The increase in SOD and GSH levels as well as decreased in MDA and NO levels were more significant (P < 0.05) in LF (10 mg/kg) treated rats as compared to that of the morin-treated rats [Table 5]. There was a significant (P < 0.05) increased in serum TNF-α and IL-1β levels as well as upregulation in hepatic TNF-α, IL-1β, and IL-6 mRNA expressions of AIA control rats as compared to that of the normal rats. Treatment with LF (10 mg/kg) showed significant (P < 0.05) decreased in serum TNF-α and IL-1β levels as well as down-regulation in hepatic TNF-α, IL-1β, and IL-6 mRNA expressions as compared to that of the AIA control rats. Administration of morin (30 and 100 mg/kg) also showed significantly down-regulated (P < 0.05) serum TNF-α and IL-1β levels as well as hepatic TNF-α, IL-1β, and IL-6 mRNA expressions as compared to that of the AIA control rats. The attenuation of FCA-induced alteration in serum TNF-α and IL-1β levels, hepatic TNF-α, IL-1β, and IL-6 mRNA expressions was more statistically significant (P < 0.05) in LF (10 mg/kg) treated rats when compared with morin-treated rats [Table 5] and [Figure 3]. The AIA control rats showed significant (P < 0.05) down-regulation in hepatic Nrf-2 and significant (P < 0.05) upregulation in HO-1 and TGF-β mRNA expressions as compared to that of the normal rats. Oral treatment with LF (10 mg/kg) showed a significant upregulation (P < 0.05) in hepatic Nrf-2 and significant (P < 0.05) down-regulation in HO-1 and TGF-β mRNA as compared to that of the AIA control rats. Morin (30 and 100 mg/kg) treated rats also show significant (P < 0.05) upregulation (P < 0.05) in hepatic Nrf-2 and significant (P < 0.05) down-regulation in HO-1 and TGF-β mRNA as compared to that of the AIA control group. Administration of LF (10 mg/kg) showed a more significant attenuation (P < 0.05) in FCA-induced alterations in hepatic Nrf-2, HO-1, and TGF-β mRNA as compared to that of the morin-treated rats [Figure 3]. [Figure 4]a represents the normal architecture of tibiotarsal joint tissues from normal rat. It is devoid of any cellular infiltration, synovitis, edema, or damage to cartilage or bone. 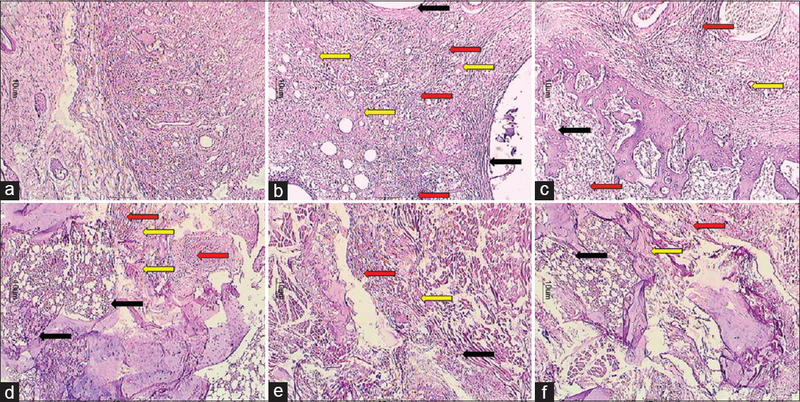 [Figure 4]b represented the architecture of joint tissues from AIA control rat and showed highly abnormal joint histology with severe (grade +++) cellular infiltration (red arrow), synovitis, edema (yellow arrow), and damage to cartilage (black arrow). [Figure 4]c represents the architecture of joint tissues from LF (10 mg/kg) treated rats, showed inhibition of cellular infiltration (red arrow), and edema (yellow arrow) with mild synovitis and damage of bones with mild (grade +) damage of cartilage tissues (black arrow). [Figure 4]d represented the architecture of joint tissues from morin (10 mg/kg) treated rats and showed mild edema (yellow arrow) in deeper subcutaneous tissues with moderate (grade ++) cellular infiltration (red arrow), synovitis, cartilage, and bone damage (black arrow). [Figure 4]e and [Figure 4]f represented the architecture of joint tissues from morin (30 and 100 mg/kg) treated rats and showed a reduction in histological alteration-induced by AIA. Adjuvant arthritis is well-established and widely used animal model for the screening of potent antiarthritic agents. In the present investigation, polyarthritis was induced in the Wistar rats that include intradermal injection of FCA with heat-killed mycobacteria in mineral oil in the tail. The tail is preferred as the preliminary site for the injection of FCA, hence that the swelling of both hind paws can be easily measured as well as chances of severe debilitation and interference of acute components of inflammation could be minimized. 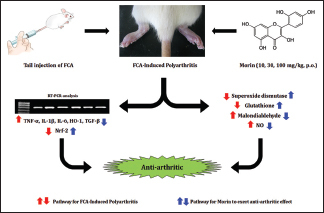 FCA-induced polyarthritic rats mimics all clinicopathological features of RA which includes joints swelling, inflammatory infiltration, bone destruction, cartilage erosion, and remodeling. The initial reaction includes the edema formation and soft-tissue thickening in both hind paw, whereas the formation of secondary lesions in the tail during late-phase of arthritis is presumed to be a manifestation of cell-mediated immunity. In addition, to mimic real-life clinical situations, arthritis was allowed to develop by keeping rats untreated for 32 days, and morin was administered for the next 28 days. The AIA is a well-characterized laboratory model of persistent pain in the arthritic study. Mechanical and thermal hyperalgesia are characteristic features of arthritic pain, whereas Randall–Selitto test, Hargreaves test have been reported methods to record these behavioral measures. Intradermal administration of FCA produces a pronounced tibiotarsal joint swelling, and hyperalgesia appeared with no involvement of both hind paw. During the acute phase of arthritis, hyperalgesia is found to occur more frequently, and reduced nociceptive threshold in AIA rats. This can be assessed by spontaneous behavior including protection of the affected paw by curving or elevation of the paw and avoiding the support of the body on the paw. Along with mechanical hyperalgesia, AIA also associated with dysregulated thermal receptor leads to a declined thermal stimuli threshold. This was evident by decreased paw withdrawal latency during the plantar test by AIA control rats. Inhibition of mechanical and thermal hyperalgesia observed after the administration of morin might be a result of an indirect modulation of nociceptor sensitization because it could attenuate release of pro-inflammatory mediators to diminishing sensitization of afferent fibers. Evaluation of the stability of serum protein against heat denaturation is another important hallmark that reflects the severity of the polyarthritic condition. The release of degradative enzymes from the lysosomes caused significant denaturation in native connective tissue that, in turn, induces an immune response in AIA. Most of the therapeutically used anti-inflammatory drugs for polyarthritis were shown to inhibit the lysosomal enzymes and restore the nature of native connective tissue. In addition, CRP, an acute-phase protein has been identified as an important biomarker for various immune-inflammatory and degenerative diseases including chronic RA. In the present study, AIA-induced rats were associated with decreased serum turbidity and elevated levels of CRP, whereas morin treatment attenuated FCA-induced alterations in serum turbidity, and CRP levels depicting its potential to improve the stability of serum protein. The typical rise in serum ALP, AST, and ALT in RA are the common features of AIA and has been well-reported previously. Determination of activity of these biomarkers in serum is a simple tool to assess the potential of various anti-arthritic agents against AIA. Increased in the activities of serum AST, ALT, and ALP are good indices of hepatic impairment which is also considered a feature of adjuvant arthritis. In addition, most NSAIDs drugs utilized in the treatment of AIA caused hepatotoxic result in the elevated levels of AST and ALT in AIA. However, administration of morin has significantly prevented the elevation of AST, ALT, and ALP revealed its organo-protective roles in AIA arthritis rats. Numerous evidence suggests that oxidative stress plays a pivotal role in the pathogenesis of arthritis., Arthritis is recognized by an elevation of oxidative stress and massive impairment of antioxidant defense system. An antioxidant system is consists of endogenous enzymes including hydroxyl radical and superoxide anions which composed of SOD, GSH, and GSH-Px that protect against oxidative stress thus alleviates elevated reactive oxygen species (ROS) generation. Furthermore, MDA is responsible for the destruction of liposome which leads to the tissue damage. Degradation of cell membranes polyunsaturated fatty acid by MDA resulted in cell death. Furthermore, Nrf-2 is an antioxidant, plays a central role in the protection of the cells against oxidative stress. In addition, exogenous and endogenous chemical exposure induce oxidative stress that might be associated with Nrf-2/HO-1 pathway in cells. Thus, various researchers have implicated antioxidant with an ability to decrease ROS generation and increase Nrf-2 production for the treatment of arthritis., Bioflavonoids have been considered as a potent bioactive moiety against free radicals and oxidative stress. In the present investigation administration of morin, a flavonoid resulted in amelioration of oxido-nitrosative stress via upregulation of Nrf-2 mRNA expression. A study has reported the role of various mediators including cytokines (TNF-α and IL's), macrophage colony stimulating factor, interferons, and platelet-derived growth factor in the pathogenesis of RA. Activated leucocytes caused the release of pro-inflammatory cytokines (TNF-α, IL-1β, and IL-6) which have been found in high concentrations in synovium as well as in plasma of RA patients. Elevated TNF-α plays a vital role in pain initiation, joint inflammation, bone deformations, and joint function disability. Release TNF-α cause sensitization of nociceptive neurons via induction of a proinflammatory cytokine cascade involving IL-1β, IL-6, and IL-8 that produces significant mechanical and thermal hyperalgesia. It has been reported that intradermal administration of FCA caused a significant increase in the levels of cytokines in synovium and blood of AIA rats., Rats-treated with morin showed the significant inhibition in up-regulated serum, and hepatic expressions of TNF-α, IL-1β, and IL-6 which in turn decreased the redness, swelling, and edema around the ankle joint of the rat. It was also evident in the gross pathological as well as the histological findings of the morin-treated rats. A study carried out by the previous researcher has reported the TNF-α and IL's inhibitory potential of morin in vivo. The result of the present study corroborates with the findings of the previous researcher. Extracellular membrane protein activation and matrix degradation subdue is correlated with TGF-β1-induced the development of autoimmunity. TGF-β1 is a most potent multitasking profibrogenic cytokine indulged in the regulation of functional immunomodulatory effects depending upon the environment thus, leading to development polyarthritis. Interestingly, TGF-β signal transduction is greatly connected with the Smads. It has been evident that Smad3 phosphorylation in the nucleus activates the formation of heteromer complex with co-Smad (Smad4) that are receptive to TGF-β. Furthermore, recently it has also been documented that FCA ingestion responsible for the TGF-β/Smad activation. Consistent with this finding, the results of the present investigation showed that there was significant up-regulation in the TGF-β mRNA expression in FCA administered rats. Whereas, administration of morin down-regulated this TGF-β mRNA expression thus, ameliorates FCA-induced arthritis. The results of the present investigation are in accordance with the findings of the previous investigator where morin treatment significantly attenuates TGF-β/Smad signaling. The current treatment regimen for arthritis includes synthetic drugs such as NSAIDs (including ibuprofen, aceclofenac, naproxen, etc.) or in combination with the steroid hormone (such as cortisone and prednisone) and DMARDs (including methotrexate, cyclosporin A, and leflunomide) which utilized to minimize the degree of pain. However, these therapies provide relief in the only a fraction of patients, and their side effect limits their use. However, in the present study, morin administration did not produce any toxicity. Nowadays, many chronic diseases involve multiple organ systems and interdependent etiological factors hence, use of single target-and single molecule-based drug development is of worthless. Hence, for have an effective treatment for the disease like arthritis there is a need for a therapeutic agent who takes care of alterations in the multiple mediators and their effects. In the present investigation, morin protected synovial membrane and prevented the destruction of cartilage, which improved health status through the inhibition of release of pro-inflammatory mediators such as TNF-α, IL's, HO-1, and TGF-β. It also demonstrates not only its ability to improve health status in arthritis but also clinical signs including paw edema, thermal hyperalgesia, and histomorphological examinations. These results showed that morin would be an effective long-term anti-arthritic agent from natural origin to overcome serious side effects of synthetic agents. The authors would like to acknowledge Dr. S. S. Kadam, Chancellor, and Dr. K. R. Mahadik, Principal, Poona College of Pharmacy, Bharati Vidyapeeth Deemed University, Pune, India for providing necessary facilities. Gomes A, Bhattacharya S, Chakraborty M, Bhattacharjee P, Mishra R, Gomes A, et al. Anti-arthritic activity of Indian monocellate cobra (Naja kaouthia) venom on adjuvant induced arthritis. Toxicon 2010;55:670-3. Patil MV, Kandhare AD, Bhise SD. Anti-arthritic and anti-inflammatory activity of Xanthium srtumarium L. ethanolic extract in freund's complete adjuvant induced arthritis. Biomed Aging Pathol 2012;2:6-15. Alfonso-Cristancho R, Armstrong N, Arjunji R, Riemsma R, Worthy G, Ganguly R, et al. Comparative effectiveness of biologics for the management of rheumatoid arthritis: Systematic review and network meta-analysis. Clin Rheumatol 2017;36:25-34. Rathore B, Paul B, Chaudhury BP, Saxena AK, Sahu AP, Gupta YK. Comparative studies of different organs of nyctanthes arbortristis in modulation of cytokines in murine model of arthritis. Biomed Environ Sci 2007;20:154-9. Kandhare A, Raygude K, Ghosh P, Gosavi T, Bodhankar S. Patentability of animal models: India and the globe. Int J Pharm Biol Arch 2011;2:1024-32. Kapoor R, Kakkar P. Protective role of morin, a flavonoid, against high glucose induced oxidative stress mediated apoptosis in primary rat hepatocytes. PLoS One 2012;7:e41663. Kim JW, Lee JH, Hwang BY, Mun SH, Ko NY, Kim DK, et al. Morin inhibits fyn kinase in mast cells and IgE-mediated type I hypersensitivity response in vivo. Biochem Pharmacol 2009;77:1506-12. Wei Z, He X, Kou J, Wang J, Chen L, Yao M, et al. Renoprotective mechanisms of morin in cisplatin-induced kidney injury. Int Immunopharmacol 2015;28:500-6. Kandhare AD, Bodhankar SL. Effect of morin in bleomycin-induced pulmonary fibrosis in rats: Critical role of inflammatory, fibrotic and apoptotic biomarkers. World Allergy Organ J 2017;10 Suppl 1:3.A6. Nandhakumar R, Salini K, Niranjali Devaraj S. Morin augments anticarcinogenic and antiproliferative efficacy against 7,12-dimethylbenz(a)-anthracene induced experimental mammary carcinogenesis. Mol Cell Biochem 2012;364:79-92. Chou MM, Vergnolle N, McDougall JJ, Wallace JL, Marty S, Teskey V, et al. Effects of chondroitin and glucosamine sulfate in a dietary bar formulation on inflammation, interleukin-1beta, matrix metalloprotease-9, and cartilage damage in arthritis. Exp Biol Med (Maywood) 2005;230:255-62. Vetal S, Bodhankar SL, Mohan V, Thakurdesai PA. Anti-inflammatory and anti-arthritic activity of type-A procyanidine polyphenols from bark of Cinnamomum zeylanicum in rats. Food Sci Hum Wellness 2013;2:59-67. Kandhare AD, Ghosh P, Bodhankar SL. Naringin, a flavanone glycoside, promotes angiogenesis and inhibits endothelial apoptosis through modulation of inflammatory and growth factor expression in diabetic foot ulcer in rats. Chem Biol Interact 2014;219:101-12. Mythilypriya R, Shanthi P, Sachdanandam P. Salubrious effect of Kalpaamruthaa, a modified indigenous preparation in adjuvant-induced arthritis in rats – A biochemical approach. Chem Biol Interact 2008;173:148-58. Hegen M, Keith JC Jr., Collins M, Nickerson-Nutter CL. Utility of animal models for identification of potential therapeutics for rheumatoid arthritis. Ann Rheum Dis 2008;67:1505-15. Nagakura Y, Okada M, Kohara A, Kiso T, Toya T, Iwai A, et al. Allodynia and hyperalgesia in adjuvant-induced arthritic rats: Time course of progression and efficacy of analgesics. J Pharmacol Exp Ther 2003;306:490-7. Kim W, Park S, Choi C, Kim YR, Park I, Seo C, et al. Evaluation of anti-inflammatory potential of the new ganghwaljetongyeum on adjuvant-induced inflammatory arthritis in rats. Evid Based Complement Alternat Med 2016;2016:1230294. Ibáñez De Cáceres I, Holly JM, Priego T, Martín AI, López-Calderón A, Villanúa MA, et al. Arthritis-induced increase in serum levels of IGF-binding protein-3 in rats is secondary to the decrease in its proteolytic activity. J Endocrinol 2002;173:357-64. Kataoka H, Horiyama S, Yamaki M, Oku H, Ishiguro K, Katagi T, et al. Anti-inflammatory and anti-allergic activities of hydroxylamine and related compounds. Biol Pharm Bull 2002;25:1436-41. Su X, Li T, Liu Z, Huang Q, Liao K, Ren R, et al. Licochalcone A activates keap1-Nrf2 signaling to suppress arthritis via phosphorylation of p62 at serine 349. Free Radic Biol Med 2018;115:471-83. McInnes IB, Schett G. Cytokines in the pathogenesis of rheumatoid arthritis. Nat Rev Immunol 2007;7:429-42. Koenders MI, Lubberts E, Oppers-Walgreen B, van den Bersselaar L, Helsen MM, Di Padova FE, et al. Blocking of interleukin-17 during reactivation of experimental arthritis prevents joint inflammation and bone erosion by decreasing RANKL and interleukin-1. Am J Pathol 2005;167:141-9. Tambewagh UU, Kandhare AD, Honmore VS, Kadam PP, Khedkar VM, Bodhankar SL, et al. Anti-inflammatory and antioxidant potential of guaianolide isolated from cyathocline purpurea: Role of COX-2 inhibition. Int Immunopharmacol 2017;52:110-8. Gonzalo-Gil E, Galindo-Izquierdo M. Role of transforming growth factor-beta (TGF) beta in the physiopathology of rheumatoid arthritis. Reumatol Clin 2014;10:174-9. Shen J, Li S, Chen D. TGF-β signaling and the development of osteoarthritis. Bone Res 2014;2. pii: 14002. Huang C, Wan L, Liu J. Effect of xinfeng capsule on nuclear factor kappa B/tumor necrosis factor alpha and transforming growth factor beta 1/Smads pathways in rats with cardiac injuries induced by adjuvant arthritis. J Tradit Chin Med 2016;36:92-100. Perumal N, Perumal M, Halagowder D, Sivasithamparam N. Morin attenuates diethylnitrosamine-induced rat liver fibrosis and hepatic stellate cell activation by co-ordinated regulation of hippo/Yap and TGF-β1/Smad signaling. Biochimie 2017;140:10-9. Wermuth CG. Multitargeted drugs: The end of the “one-target-one-disease” philosophy? Drug Discov Today 2004;9:826-7.